maybe the most polluted city you mean. 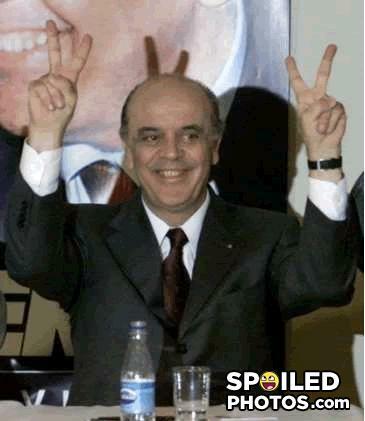 He is a Sâo Paulo governor and will seer president in 2010 !!! victory for the devil.... he's behind it all. Maybe ? certainly the most important brazilian city !!!!! Presidente de São Paulo? Would that be prefeito de São Paulo? kkkkkkkkkkkkk se fodew aew nerdão Serra é matador, vai matar a todos nos, É DILMA NELES!!! to who don't understand: he's one of the candidates for the Brazil presidency in 2010 He was the São Paulo's state Governator. What happened When The lion asked the dog of a soda can? The giraffe who is taller the lion or the whos the fastest?